This afternoon I was able to spend about 3.5 hours working in the basement on Ana’s craft table. I’m almost done with getting the trim on and will be starting on the doors and drawers next. It’s taking a while since I only average 3-4 hours per weekend on it, but so far so good. Here’s one of the two table ends, with trim complete. 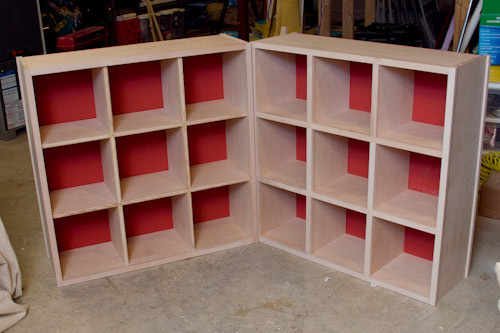 The center column is going to be open cubbys, while the bottom corners are going to each hold two drawers. The remaining will have doors. Here’s the pair, the one on the left still has some trim waiting for me to complete.